Appearance anxiety comes easily in Paris. A solution does not. On a gray morning in Paris, I pushed back the heavy velvet curtains in my hotel room. 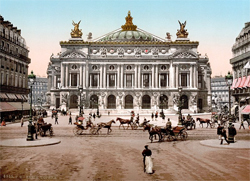 There, just across the street, almost close enough to touch, was Charles Garnier’s extravagant opera house — the Palais Garnier. I didn’t know where to look first. The Corinthian columns with gilt capitals? The rose granite friezes? the shiny tips of gold Pegasus wings? I left the curtain open and padded into the bathroom. A glance in the mirror over the sink revealed a sight anything but grand: the face, so pale; the multidirectional hair, frizzy with split ends; the pajamas, gaping around the shoulders. After gazing at the confectionary Opera, my reflection nearly gave me culture shock. Mustn’t look in the mirror again today, I thought, and dressed quickly, keeping my gaze trained out the window.